Harry Potter. Hardly are those words out before people react. For years, J. K. Rowling’s creation has inspired adoration and fandom on the Olympic scale. But without the depth of a book’s narration, or the tricks and trappings of CGI, can the Potter prestige work on stage? Especially now that he’s a grownup, with kids and problems that the young, feisty Harry never imagined? Not to worry. 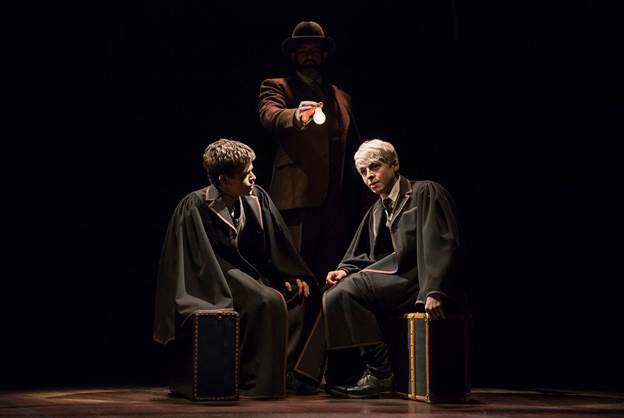 After a somewhat slow start, crammed with exposition, Harry Potter and the Cursed Child, Parts 1 and 2 will have you in its spell. Cursed Child asks the question: if it were possible to turn back time and fix the mistakes of the past, would you? Even more important, should you? It also weaves a story about family, loyalty, and good-vs-evil, played out over a background of unintended consequences. In case you know nothing about the wizarding world of Harry Potter, a brief synopsis: a neglected, orphaned English boy finds out that he’s really a wizard, and that his parents died saving him from The Dark Lord. He goes to wizard school. Years pass; he has friends and adventures. Some of the wrong people die, but eventually, good triumphs, evil is vanquished, and the hero gets the girl. 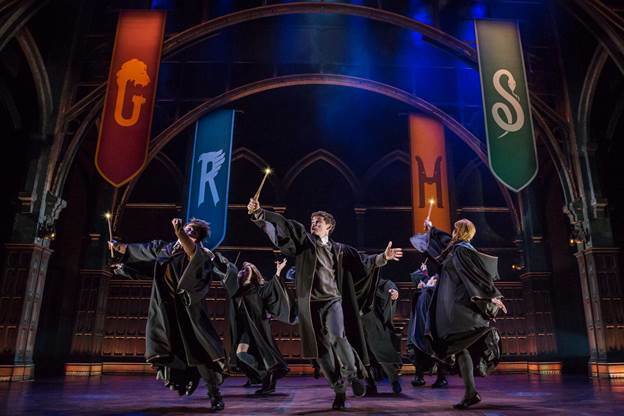 You can fill in some of the missing details while you wait for the first act curtain; the Showbill provides synopses of the seven Harry Potter books, and a “good to know” section. 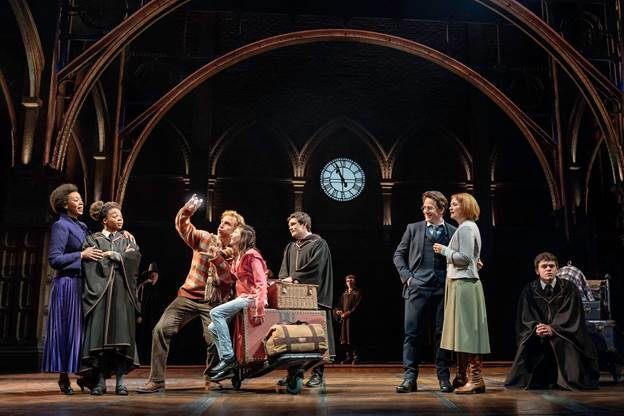 As always in Potter-land, the story focuses on young people, but for Cursed Child, the older generation gets involved; it wouldn’t be much of a Potter story if Ron (Paul Thornley) and Hermione (Noma Dumezweni) weren’t around. And of course, we have Harry himself (Jamie Parker), the most famous wizard in the world, who is now middle aged, fearful, and angry, and his wife, Ginny (Poppy Miller). 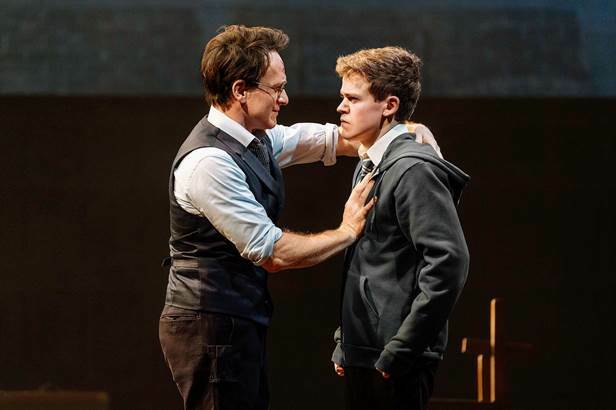 Cursed Child focuses on one of Harry’s kids, the resentful and insecure Albus (Sam Clemmett), who’s about to go off to the wizard school, Hogwarts. On the train, he meets Scorpius Malfoy (Anthony Boyle), the son of Harry’s old enemy Draco Malfoy (Alex Price). They become best friends at school, and, in true Harry Potter style, with the best of intentions, they mess with magic to solve a problem. As they get in too deep, and try to fix it, layer after layer of wizard’s magic come into play. The production pleads with us to #KeepTheSecrets, so that’s all the plot that can be said without revealing too much. Rest assured, good triumphs and evil is vanquished. In addition, wounds heal, families come together, and darkness is turned back. With lots and lots of eye-filling magic. Some of the most breathtaking stagecraft ever made reaches out of the Cursed Child proscenium arch, and grabs you in your seat. That’s really the best part of the show – the splendid sets (Christine Jones), lighting (Neil Austin), costumes (Katrina Lindsay), sound (Gareth Fry), and in particular, the smashing video design (Finn Ross and Ash Woodward) and illusions and magic (Jamie Harrison). For that matter, a transformed Lyric Theatre draws you in to the Potter world from moment one. Clearly, a good chunk of Cursed Child’s reported $68M cost went into the theater itself; it’s simply gorgeous and completely redone in Potter-themed décor, from the sconces to the carpet to the wallpaper. Even a Scrooge-level cynic would be enchanted by this theater, the wonderful design, and the terrific theatrical illusions, made to enfold you completely in the embrace of J. K. Rowling’s saga. That’s a pretty good place to be, for the five hours or so of Harry Potter and the Cursed Child, Parts 1 and 2.